This article will show you an easy method to share VPN connection via hotspot to use it on PC or other device. It doesn't matter the VPN app you are using, Hotspot shield, Tweakware, Nairabit VPN, Psiphon, Http injector, KPN Tunnel, Eproxy, any VPN whatsoever even with free browsing cheat. Another exciting thing about this is that this VPN tethering works on both root and no root (non rooted) devices. What's needed to Share VPN connection Via Hotspot, Bluetooth, USB using Pdanet+? Very good USB data cable to connect your android device (For USB Tethering). 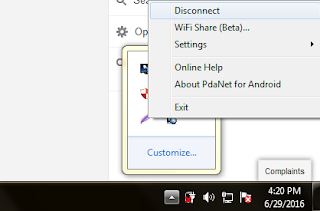 Go over to your PC, click and run PdaNet and select the same connection option as the one you selected on your mobile phone PdaNet app. What this means is that if you choose usb tethering on your android, you must first connect you android phone via USB cable to your PC then choose USB Tethering on the android phone while also choosing USB Tethering on PdaNet on PC. Go to the notification bar on your PC and click connect. That's all, now you know how to share VPN connection via hotspot tethering with other options like Bluetooth and USB Tethering. Have fun !